Link to images and more information on JPods effort in Boston. Senate Bill #1837. Bill currently in the Joint Transportation Committee. When this bill becomes law, bureacracies will have to write reasons they are rejecting transportation networks that can be built without taxpayer expense that exceed 5 times the gas mileage of automobiles. 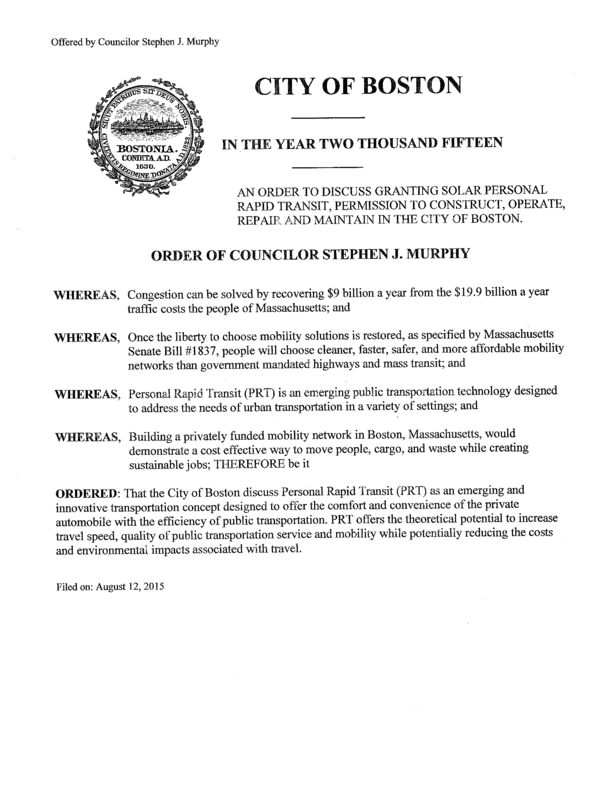 Boston City Council call for a hearing on Oct 5, 2015. Boston Globe article, Aug 13,2015. Please share with your friends. To prevent a repeate of the Boston Tea Party, a riot against the unjust actions of the King's transportation monopoly, Article 6 of the Massachusetts Constitution forbids monopolies such as the MBTA. The MBTA and MassDOT create monopolies that blocked the Solar Mobility Act (S1837 in the 2015-2016 legislature and S1970 in the 2017-2018 legislature). These bills would have allowed solar-powered version of Morgantown's Personal Rapid Transit (PRT) network to be built in Massachusetts. Note that in the same period Morgantown's PRT delivered 150 million injury-free passenger-miles, 1.8 million Americans were killed on roads.